The Gibraltar Upper Rock Nature Reserve is a protected nature reserve on the upper part of the Rock of Gibraltar that covers over 40% of its land area. It was established as the Upper Rock Nature Reserve in 1993 under the International Union for Conservation of Nature’s category Ia (strict nature reserve) and was last extended in 2013 when it was renamed the Gibraltar Nature Reserve to refl ect its wider scope outside the Upper Rock. The protected area now covers the Great Gibraltar Sand Dune, Windmill Hill and the Europa Foreshore. The reserve was established in 1993 to protect the area of land that the United Kingdom’s Ministry of Defence had decommissioned from military use. The ‘Upper Rock’ area is known for its semi-wild population of Barbary macaques and is an important resting point for migrating birds. Its purpose is to preserve the wildlife and natural and historical sites, while providing access to the public. Mammals include the red fox, European rabbit and mouse-eared bat although the best-known residents are the Barbary macaques that make the reserve their home. The flora and fauna of the nature reserve are protected by the law of Gibraltar. Gibraltar has more than six hundred species of flowering plants. The maquis, or dense Mediterranean scrub, is mostly made up of tall bushes that include wild olive, Mediterranean buckthorn, lentisc, Osyris and terebinth, and smaller bushes that include shrubby scorpion vetch, spiny broom, teline, wild jasmine, shrubby germander and felty germander. The bay laurel and the dwarf fan palm are also found in parts of the maquis. The many cliffs around the reserve harbor joint pine, dwarf fan palm, sweet alison, Biscutella and wild parsley.Distinctive plants include the Gibraltar candytuft, white Gibraltar chickweed, Gibraltar saxifrage and Gibraltar thyme. The Gibraltar campion is a very rare species found only on Gibraltar that was thought for a while to be extinct. 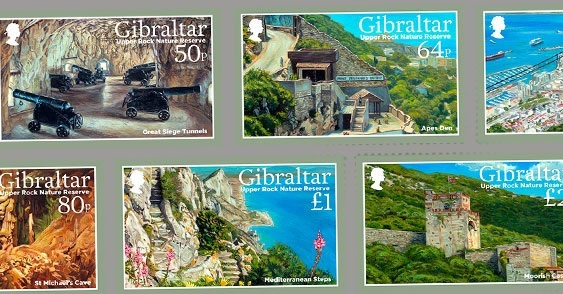 The stamps feature the 71m long ‘Windsor Bridge’ - Gibraltar’s first suspension bridge, located between two Batteries and constructed over a 50 metre gorge; the famous ‘Great Siege Tunnels’; the popular Apes’ Den; the Cable Car; the incredible St. Michael’s Cave; the awe-inspiring Mediterranean Steps and the Moorish Castle.